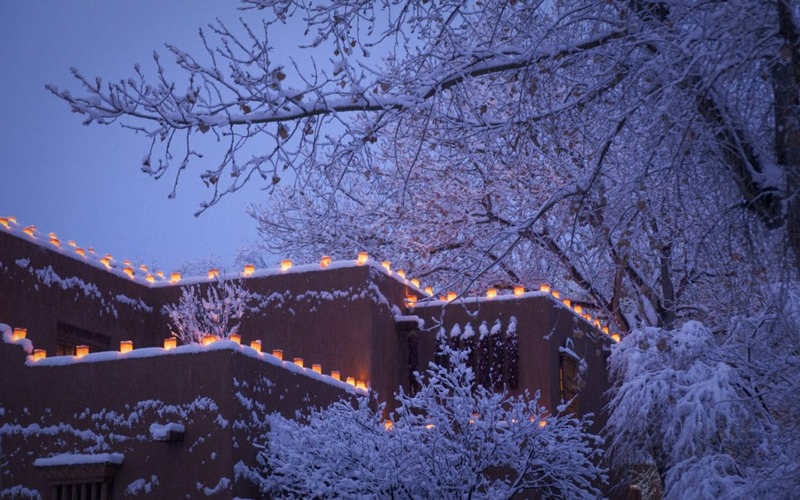 The holiday season here in Santa Fe is one of our favorite times of the year. Lights, music, and a host of annual activities make this a magical place to visit during the Christmas season. But if we could choose just one night to be here in Santa Fe, it would be Christmas Eve. On Christmas Eve, Canyon Road (home to many of the city’s art galleries) is closed to traffic, and the city gathers there to celebrate. The street is alight with thousands of fairy lights, and luminarias (also known as farolitos) which are sand filled paper bags with candles in them that line the sidewalks and the tops of buildings and walls. Historically, this tradition started as small bonfires that were made with crisscrossed piñon branches built in squares about three-feet high and are said to light the way for the Christ child. These beautifully, lit walkways have been a part of Santa Fe tradition since the 19th century. Starting at dusk, people wander up and down Canyon road, enjoying the sights, and warming themselves up by visiting the many galleries and shops that stay open to offer hot chocolate and cookies. There are even wandering groups of carolers, helping spread the holiday cheer. It’s a time for everyone in Santa Fe to come out and celebrate together. After visiting Canyon Road, many people head over to midnight mass at the Cathedral Basilica of Saint Francis de Assisi. The doors usually open at 10:30pm, with Lessons and Carols starting at 11pm. By the time the mass starts at midnight, there is not an empty seat. It’s a wonderful blending of Catholic & Santa Fe traditions and not to be missed. If you’re looking for an earlier mass, San Miguel Mission – the oldest church in the United States – offers mass at 7 pm. Christmas in Santa Fe offers so many different ways to celebrate the holidays. Our location means that you are walking distance to all the holiday festivities, from luminarias and concerts, to midnight mass. Check our availability so you can be close to all the wonderful holiday festivities! Pilgrimages are as old as most religions, tied together by and sharing a similar goal and a path to follow to get there. And as defined, somewhat, by Eleanor Munro in her book On Glory Roads: A Pilgrim’s Book About Pilgrimage, there are often several processes involved. The most poignant one being that pilgrimage is linked to our need to orient ourselves in the universe, a way to fix ourselves to the motions of the heavens. We find ourselves a polestar and we get ourselves to it. If not at least once then regularly. Why? Because this particular type of ritual connects us to the cosmic order, which in turn connects us to ourselves and each other. Most religions have recognized the value of this type of physical experience, the way it creates a sense of shared journey with others of like beliefs. But one need not be of any particular religion to go on a pilgrimage or find value in going on one. There are probably just as many secular pilgrims as religious pilgrims. But the paths they walk—or the reasons for walking these paths—often are the same: they are physical manifestations of a spiritual commitment each pilgrim feels is needed to enhance his or her life. Certainly, pilgrimages go back centuries—to the Basilica of Our Lady of Guadalupe in Mexico City, to Lourdes in France, and the Santiago de Compostela in Spain (which is 1,000 miles long and takes over two months!). Even hikers along the Appalachian Trail, or the path taken by Cheryl Strayed up the Pacific Crest Trail for her memoir, Wild, haven’t been out there merely to enjoy nature and be outdoors. They’re there to get at something deeper, or higher. These are all routes people—pilgrims—have taken for centuries, sometimes millennia. And along the way, villages arose, often spaced a day’s walk apart and founded to feed, house, and encourage travelers—and sell them mementos and religious artifacts as signs of their accomplishment or objects of inspiration, items such as shells from the ocean at Santiago, or small handmade crosses and figurines of Jesus or the Virgin of Guadalupe in Mexico. New Mexico has its own famed pilgrimage: Santuario de Chimayo. Leading up to Easter weekend, you’ll see people walking from as far away as Albuquerque, Raton, Taos, or Socorro. Some alone, some in groups, usually along the highways and county roads, young, old, too young, too old. People who look like they’ve never walked further than their driveway. All sharing a common goal: to make it to a remote church built by Catholic friars hundreds of years ago in the tiny town of Chimayo, 28 miles north of Santa Fe. At this location, the Santuario de Chimayo, there was a mysterious spot that the Native Americans long ago recognized as having special healing powers. Mysteriously, fine sand endlessly appeared in a hole in the earth. Sand that seemed to replenish itself. The Spanish interpreted this as a sign from God and associated it with His power to cure illness through faith. As often was the case, the Spanish, like so many conquerors, then built their church directly on top of the indigenous peoples’ shrines. Instead, the Native Americans’ healing place not only survived but transcended its transformation into a Catholic church. And not unlike the Native Americans who’d been there before them, the peoples of Northern New Mexico found themselves drawn to the Santuario’s mysterious healing powers. Today, signs of the Santuario’s healing powers are everywhere: the walls and ceilings are adorned with discarded crutches and canes, braces for arms, legs, necks, and backs, and even collapsed wheelchairs! And both inside the church and outside, in the porticos ringing the church, are hundreds of photos, most of family members standing next to or hugging their loved ones who’ve been cured by their faith in the holy sand. While not for the fainthearted, today’s Chimayo pilgrimage offers a sense of rebirth and health for Catholics and non-Catholics alike, providing spiritual and communal bonding for all its participants. Upon returning to Santa Fe, pilgrims in want of more earthly spirits are always welcome here at the Inn on the Alameda. The Agoyo Lounge, in particular, offers sojourners and guests alike a seasonally changing menu of regional foods, cocktails, and wines. Our staff is always ready to share their evenings with you in our small, intimate Inn. And though we may not be the Santuario de Chimayo, we consider many of our guests as pilgrims—many of whom come back to the Inn on the Alameda more than once, often in search of our humble hospitality, a place where they can orient themselves in Santa Fe if not the universe. In a small Chapel within St. Francis’ Cathedral lies a remarkable figure. A unique piece of devotional art and an amazing witness to history, La Conquistadora, continues to be venerated today within the Catholic Church. Standing only 30 inches tall, she is the oldest recorded Madonna in the United States. She was built in Spain, travelled to the new world and witness to the bloody climax of the Pueblo Revolt. Then smuggled into exile, protected from harm, companion to De Vargas through his reconquest of Santa Fe and New Mexico, and worshipped today as a divine symbol of peace and avoidance of bloodshed. The history of this Icon is an apt representation of the rich and colorful past and present of New Mexico. Carved in Spain during the early 17th century, the delicately featured Icon first entered recorded history in 1625. A Franciscan missionary by the name of Fray Alonso de Venavidez installed and dedicated a small shrine in Santa Fe at the Church of the Assumption. Changes in Catholic dogma had begun to emphasize Mary and the Immaculate Conception, and the church became the first shrine to Mary in what would become the United States. Beyond the walls of the chapel, however, there was great unrest. These were the years of harsh conversion, dissolution of traditional social structures, forced labor, cruel punishments and devastating disease amongst the native Pueblo inhabitants. It was in this context that the Pueblo Revolt, as discussed elsewhere on the site, began. It is said that The Lady had warned the Spanish settlers of the coming revolt with dreams and visions and signs. Despite these premonitions, the settlers were unprepared for the violence of the Pueblo Revolt, when a coordinated rising amongst the pueblos exploded on August 12, 1680. Led by the charismatic holy man, Po’Pay, the Puebloans sought to eradicate all traces of the Catholic religion. Santa Fe burned, 21 friars were killed, and the colonists fled. Amidst the violence and chaos, The Lady was rescued from the burning church and accompanied the fleeing settlers. Moving to what is today Juarez, Mexico, the settlers nursed hopes of returning to their former homes. The Lady was held by the exiled settlers for twelve years. It was in 1691 that Spain sent forth Don Diego De Vargas to reclaim the New Mexican territory. Setting out with the exiled colonists and his soldiers, De Vargas began the resettlement and reconquest of New Mexico. Traveling with a large host under the banner of the Lady De Vargas presented an intimidating and imposing presence. Under his banner, many of the rebellious tribes surrendered peaceably and re-pledged their allegiance. It is this event, the largely peaceful reconquest of Santa Fe and New Mexico, that we still celebrate today with Fiesta. Under the banner of The Lady, now known as La Conquistadora, Santa Fe once again came under Spanish rule. Though rebellion and harsh persecution would continue over the next few years, Santa Fe itself was not threatened again. Recognizing the improbability of the initial peaceful reconquest, the Settlers began an annual veneration in thanks for the icon’s aid. La Conquistadora became an integral part of the native Catholic iconography. Volunteers pledged their time and money to the Icon’s celebration and exaltation. Today the Cofradia del Rosario [or Rosary Cofraternity] continues to be active in the New Mexican Catholic community. Dressing La Conquistadora for her annual appearances soon led to her amassing a significant collection of jewels, dresses, and coverings. Her veneration is reflected in the beauty of her coverings and the elaboration of her worship. Her procession grew over time, and what was a simple shelter soon became a Chapel. Over time, a great Cathedral rose around the smaller Chapel and today the Basilica of St. Francis surrounds the Chapel. La Conquistadora endures as a celebrated Icon to this day, remaining an essential part of Santa Fe’s temporal and spiritual history.